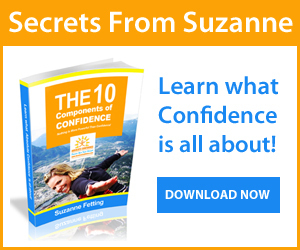 #1 - Get a confidence coach or a mentor! Spend time every day with confident people that you admire. You will be inspired by their strength, attitude and energy. It's infectious! You will find that your confidence increases much quicker. Your level of happiness is directly related to the quality of the relationships in your life. Having a confidence coach in your life will enable you to make decisions that will improve your life and help you discover your inner strength. #2 - Get to know your authentic self. Having self-awareness is the first component of confidence. Knowing and understanding all aspects of yourself including your values, beliefs, skills, talents, gifts, passions, goals, as well as your weaknesses and faults. Unfortunately, most people do NOT know enough about themselves to reach their highest potential, to determine their dream job or to live their lives in the most fulfilling and rewarding way. The more you know and understand yourself, the better you are able to accept yourself or change yourself and the more confident you will become. 2) What am I all about? 4) What can’t I do? #3 - Remember your past achievements. How great did it feel when you achieved a goal you set for yourself? You felt confident and fulfilled, right? Remember how good it felt to make a new friend, try a new activity or to get a promotion at work. #4- Be open and willing to make positive changes in your life. Set realistic and attainable goals for yourself that will bring positive change. Do you have negative thoughts and emotions or negative people in your life that are controlling and draining you? Start by "cleaning out" your negative thoughts and emotions. What negative things in your life do you want to rid yourself of? Make a list of the positive things you want in your life and be sure to give yourself a timeline. If the task of changing your negative thoughts and emotions seems a bit overwhelming, remember that most of the negative beliefs (as well as the negative people) that you have right now were put into your mind and/or life with your cooperation. You have the ability to change that! Change how you feel about yourself and your life and you will radiate happiness and contentment. #5 - Visualize the confident you. To achieve what you want in life, you have to believe it. I mean, REALLY believe it. If you can visualize yourself doing something you wish you could do, you are more likely to make it your reality because you'll have confidence in your ability to succeed. The idea is to have these images or events taking place in your mind in vivid 3D with rich colors, like a dream, or as real as watching T.V. or a movie. The clearer the visualizations you have, the more likely you are to achieve the results you desire. When fearful or distracting images appear, re-focus on those positive images that evoke feelings of happiness and fulfillment. #6 - Make a list, check it twice! Write down 5 reasons why you want to be confident. List them in order of importance from 1 to 5. The numbers indicate the level of importance. i.e. Do you want to be more comfortable meeting new people? Do you want to live a happier and more fulfilled life? Do you want a new job or a promotion? Etc. #7 - Commit to your confidence. If you have decided that you want to change your life and improve your confidence, do it now and don't turn back! Go out and try something new, or go to that party or event that you'd usually skip and let others know you are there and that you have a lot to contribute. You'll most likely make some new friends too! If you feel you would benefit from taking a course or getting a confidence coach, do it... you will not regret discovering your inner strength. Be warm, genuine and personable. These personality traits are a must when building confidence. If you are fake, other people are likely to sense this and may not be interested in meeting you or may reject you. #9 - Always be open to learning and developing your confidence skills. Try new activities, go out to meet and connect with new people. You could make a new friend! Your level of happiness is very closely tied to the quality of the relationships in your life. The more quality relationships that you have with great people that you connect with, the happier you will be. Smile at a stranger or better yet, strike up a conversation. #10 - Do something today that scares you. When we step outside of our comfort zone and take risks, we force ourselves to learn and grow.Fear robs us of our happiness and fulfillment. Be aware of of your old habits and be conscious and deliberate about stepping outside of your comfort zone. 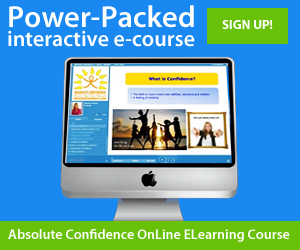 Push yourself and give yourself a huge boost of confidence! #11 - Never give up! No one is confident all the time. Even the most confident people have doubts and fears about certain things. You are not alone. The important thing to remember is that you MUST always strive to be the most confident person you can be. When you are confident, you feel great about yourself and your life, and so will other people around you. Whenever you feel unhappy or feel frustrated, do something that you know will be positive and effective. For me that's doing something outdoors, listening to music, looking at photos from the amazing adventures I've had in my life, or reading the Success Stories from my clients and students.